Hyderabad: If Charminar is the symbol of Hyderabad, the Qutb Shahi Tombs along with Golconda Fort are an integral part of the city's rich history and culture. A unique royal necropolis, Qutb Shahi Tombs are a must on the itinerary of visitors to the city. The Qutb Shahi Heritage Park, as the entire complex is called, has 72 monuments including mausoleums of rulers of the Qutub Shahi dynasty (1518-1687) spread over 108 acres at the foot of the majestic Golconda Fort. Like many historic monuments in this 425-year-old city, the tombs have also been long neglected and face threat from encroachers. The 16th-17th century necropolis is now getting a new lease of life thanks to the Aga Khan Trust for Culture (AKTC), which began the conservation work in November 2013. 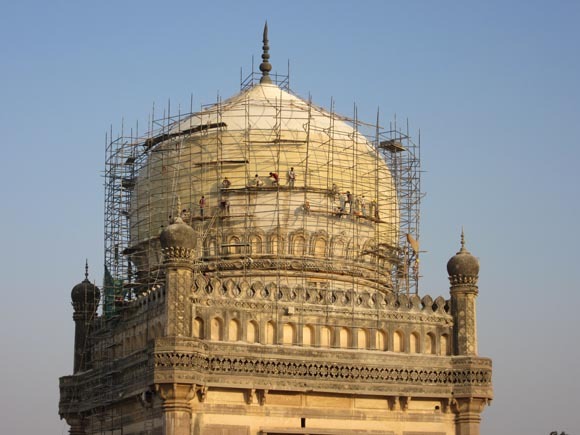 For AKTC, a not-for-profit organization engaged in conservation of monuments in various countries, this is the second conservation project in India after Humayun's Tomb in Delhi. "The scale of the Qutb Shahi Tombs project is enormous. Perhaps nowhere in the world such a large-scale project was undertaken," Ratish Nanda, project director of AKTC, told IANS. 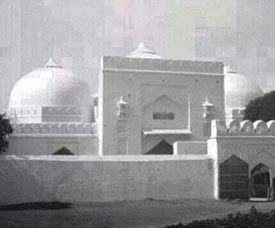 The complex has 40 mausoleums, 23 mosques, six 'baolis' (step-wells), a 'hamam' (mortuary bath), pavilions and garden structures, each with its striking grandeur and a unique synthesis of architectural styles. "There is no site like this anywhere in the world. In one complex there is such a huge diversity and architectural styles. There are at least 10 monuments which are of the scale of the Taj Mahal," said Ratish. The monuments in the complex are a blend of Persian, Pathan and Hindu architectural styles and built with local granite and traditional materials. AKTC had initially earmarked Rs.100 crore for the project. But Ratish said the cost may exceed if there are more discoveries like a 16th century wall enclosure they found during excavation at one of the tombs. "The trust is committed to spending any amount of money by raising the same from its donors or its own money," said Ratish. Given the magnitude of the project, he believes it may take 10 years to complete it. Before launching the project, the multi-disciplinary team of experts in 2012 carried out exhaustive recording, documentation, condition assessment, surveys and research exercise to understand how the entire complex would have originally looked. The project officials found that the task to restore and retain the authenticity of the monuments is gigantic as plaster work of the wall and dome surfaces had deteriorated due to dampness and water seepage. The inappropriate application of 20th century material like cement during the earlier repair works disfigured the historical architectural character. "We are using only lime mortar mix, stone, wood and other traditional materials originally used in the construction," said Rajpal Singh, chief engineer, AKTC. Banking on its experience and expertise, the trust is carrying out the work in a phased manner. At any given time, 75 percent of the complex will remain open for tourists. Currently focussing on the southwestern corner, AKTC plans to complete conservation and restoration of 30 monuments by 2016. Besides involving 30 experts including historians, conservation activists and architects, AKTC has hired master craftsmen for the works, which are expected to generate over 300,000 mandays of employment. Project officials say 80 percent of the cost is being spent on master craftsmen. The project also involves landscape restoration of the core monuments zone as well as ecological restoration to revive 'Baolis', aqueducts and planting native trees. Over the centuries the original landscape has been altered and disfigured and as such today bears no resemblance to the original builder's intention. "Our principal objective is to ensure that these monuments survive for another 500 years," said Ratish. "Once the work is finished it will be like the Taj Mahal and attract tourists from all over the world and also improve the quality of life in Hyderabad," he promised. The Telangana government is also planning to tap Rs.85 crore announced in the union budget for restoration of the tombs. The government proposes to use it for building site museum, landscape garden and more. "Our aim is to propose the tombs along with Golconda Fort for UNESCO world heritage site," said B.P. Acharya, principal secretary in the department of tourism and culture in Telangana. The tag always eluded the tombs despite their rich heritage, historical and architectural value.